Backups are essential with Windows 8 tablets, where the fumble of a finger or leap of a cat can accidentally delete your files. Even worse, tablets rank highly among thieves, as they’re easy to wipe clean and sell to a pawn shop. File History: File History automatically backs up your Documents, Music, Photos, and Video libraries every hour. That not only keeps your work safe, but gives you a long string of backups to choose from: You can easily grab yesterday’s document if you’ve irreparably messed up the current version. System Image: Found only on tablets running Windows 8, System Image contains your entire tablet’s C: drive: Windows 8, your programs, settings, and files. It’s the whole enchilada. If your tablet’s stolen, you can restore the System Image onto your replacement, and be right back where you started. Your tablet’s memory card: The simplest but weakest solution, this creates backup copies on a memory card. (Almost all Windows tablets include a slot that accepts an inexpensive memory card.) Unfortunately, if somebody steals your tablet, they’ve also stolen your backup. Also, most people fill their tablet’s memory card with favorite movies, music, and photos — not boring backups. Flash drive: Flash drives rarely hold enough files to make File History worthwhile. And until you remember to manually to insert the drive into your tablet’s USB port, File History won’t be working automatically. But if your flash drive holds at least 32GB, it’s better than nothing. Portable hard drive: A better solution is to plug a portable hard drive into your tablet, and wait while File History creates its backup. However, not everybody owns a portable hard drive. Plus, only the most disciplined tablet owners always remember to plug in their drive to create a backup before leaving on a trip. A network location: The best solution, this automatically backs up your tablet’s files onto a PC on your home network. It’s automatic, and it happens whenever your tablet comes within range of your home network. Slide your finger in from the right edge to fetch the Charms bar, and then tap the Settings icon. Then tap Control Panel from the top of the Settings Pane. When the desktop Control Panel window opens, find the System and Security section, then tap the words, Save Backup Copies of Your Files with File History. The File History window opens. Choose where to save your backup copies and tap the Turn On button. The File History window lists any attached drives or memory cards for you to choose with a tap of your finger. Don’t see your drive listed? Tap the Select Drive link from the window’s left edge, and navigate to your drive before tapping the Turn On button. Tap the Advanced Settings link and the Advanced Settings page appears, where you can change the backup time from one hour to 3, 6, 12 hours, or even daily. The Advanced Settings page also lets you change how long Windows should keep your backups. It normally saves them forever, which is unrealistic. Instead, change it to Until Space Is Needed, or 3 Months. If you don’t want a folder backed up, exclude it from File History. Tap the Exclude Folders link on the left, tap Add, and then choose the folders you want excluded from the backups. If you have a wireless network at home, save backups on one of your network’s PCs. File History then automatically backs itself up wirelessly whenever you’re within range of your home network. To choose a network location for File History, tap the Select Drive link, tap the Add Network Location button, and navigate to a folder on your desktop PC. A System Image saves everything: your files, programs, settings, and even Windows itself. It’s a complete copy of your tablet’s hard drive. Should your tablet be stolen, you can buy another tablet of the same make and model, restore your System Image onto the new tablet, and be back to where you were before you left the house. You can only create a System Image on a tablet running Windows 8. 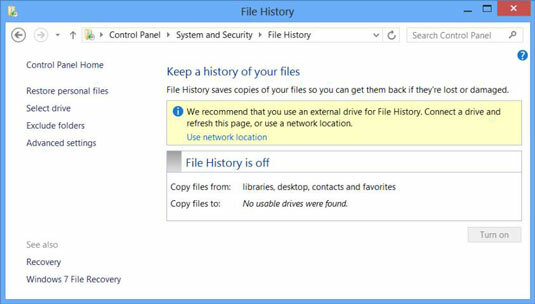 Tablets running Windows RT should store their most important files on SkyDrive, or use File History to save backups to a flash drive, portable hard drive, or home network. When the File History window opens, look in the far bottom left corner and tap the words Windows 7 File Recovery. When the Backup or Restore your Files window appears, tap Create a System Image from the window’s top left corner. Follow the instructions to save the System Image on a portable hard drive or a place on your home network.